In a large bowl, mix together yogurt, garlic, salt and pepper. Add radishes and cucumbers and stir to combine. Cover and refrigerate for at least 15 minutes before serving. 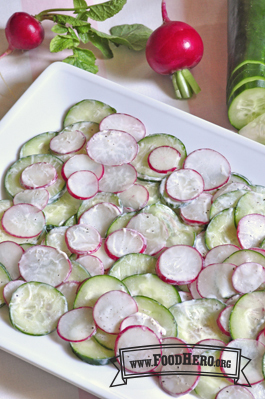 4 Comments for "Radish and Cucumber Salad"
I love the taste of the radish and cucumber salad because it is like salad with poppy seed sauce. Even though there aren't poppy seeds in this recipe, the radishes can have a little peppery taste. I liked it but it would be better I'f it had no salt and pepper. It would also be better if it had some spinig and croutons. But I really liked the slimy wet texture to it. I wouldn't prefere any yogurt but maybe you can try some ranch.